So today is the day to vote for the Canadian federal elections. I do hope that all eligible Canadians got out to vote today, if not earlier at advanced polling stations. These elections are important, with a possibility that a majority government will be elected this time around. Having lived outside of Canada for almost eight years now, it’s easy to get disconnected to the political issues, wranglings and manoeuvrings that go on at “home”. Although it’s more of a challenge to follow the political news, I’ve had the opportunity to vote in by mail with special mail-in ballots. For those who haven’t seen such a ballot, have a look here. This entry was posted on Tuesday, May 3rd, 2011 at 2:15 am. 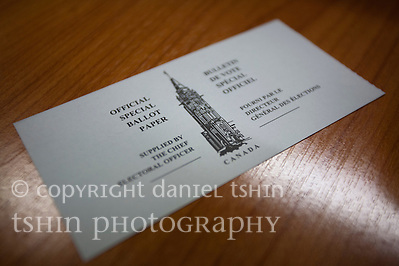 It is filed under Hindsight and tagged with ballot, elections, Elections Canada, voting. You can follow any responses to this entry through the RSS 2.0 feed.